Friends of the Strum Public Library The Friends of the Strum Public Library is a 501 (c) 3 non-profit organization that works to raise money for the library. Currently, the Friends of the Library takes on a number of fundraising projects throughout the year and all money raised goes towards paying off the mortgage on the library building. A significant amount of money still needs to be raised. The Friends of the Strum Public Library welcomes any and all donations. Larger donors are recognized on plaques in the library, and naming rights and memorial donations are accepted. Meetings The Friends of the Strum Public Library group meets monthly during most of the year. Meetings typically take place on the third Tuesday of the month at 6:30 p.m. in the Library's Community Room. New members and guests are always welcome to participate in the meetings and encouraged to join us for fun and friendship. Join Us Would you like to join the Friends of the Library? 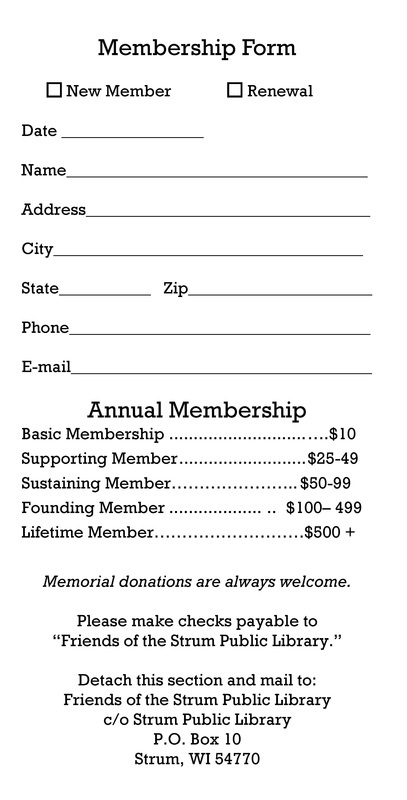 Memberships start at $10 per year. Click here to download a printable membership brochure. Souper Friends Supper – January 15th 4-6 p.m.
Meeting date – January 15th 6:30 p.m.
Souper Friends Supper - February 19th 4-6p.m. Meeting date February 19th 6:30 p.m.
Meeting date – March 19th - 6:30 p.m.
Meeting on April 16th – 6:30 p.m.
Meeting date – May 21st – 6:30 p.m. Annual and regular meeting date – October 15th 6:30 p.m.
Meeting date – November 19th – 6:30 p.m.
Christmas pot luck – December 3rd – 6:30 p.m.